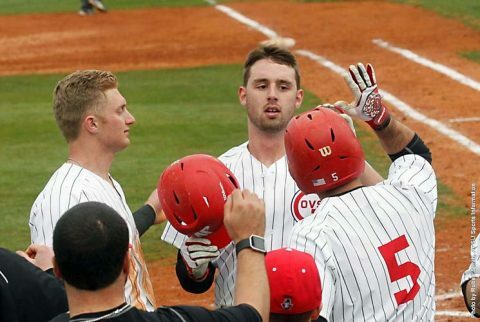 Clarksville, TN – Austin Peay State University’s baseball team freshman Parker Phillips had two home runs and four RBI on the day, but the Governors had few answers for a hot Tennessee Tech squad and dropped both ends of an Ohio Valley Conference doubleheader, 14-3 and 10-8, Friday at Raymond C. Hand Park. Tennessee Tech (19-6, 8-0 OVC) wasted little time establishing a lead in the series opener. After a sacrifice fly, first baseman Chase Chambers hit a two-run home run followed by catcher Chris Brown’s solo shot to establish a 4-0 lead in the first inning. Austin Peay (11-11, 4-4 OVC) had an opportunity to break through in its half of the first, loading the bases with one out. However, Tennessee Tech turned the first of three double plays to turn the Governors threat aside. The Govs would get on the board in the second with second baseman Kyle Wilson‘s one-out triple. Catcher Alex Sala would ground out to shortstop, allowing Wilson to score. The teams then traded solo home runs in the third inning – TTU designated hitter Ryan Flick followed by Phillips’ first home run. The Tennessee Tech defense would then proceed to stymie the Govs over the next three innings. The Golden Eagles turned a reverse double play to wipe out a Govs base hit in the fourth. Third baseman Trevor Putzig then made a diving stop of a Phillips’ hard ground ball down the third base line to end the fifth. But the dagger may have come in the sixth when Tennessee Tech turned two stellar defensive plays. Putzig denied pitcher Alex Robles of a base hit and started a double play for the inning’s first two outs. The Govs then saw the next two batters reach base safely but catcher Alex Sala line drive into the right center gap was caught by a diving Alex Junior to end the threat. Tennessee Tech broke the game open in the seventh when Brown hit his second home run, a two-run blast that extended the lead to 10-3. Right fielder Kevin Strohschein added a two-run home run in the eighth to set the final score. Robles (3-3), the Govs starter, was tagged for the loss after allowing eight runs on 10 hits. However, he allowed just one walk while striking out nine in his 6.2 inning outing. Phillips went 2-for-3 in the opener with his solo home run. Robles would go 2-for-4 at the plate. Freshman outfielder Tyler Hubbard added a pinch hit home run – his first collegiate hit – in the ninth inning. Tennessee Tech starter Michael Wood (5-1) notched the win after holding the Govs to two runs over seven innings while striking out seven. The Golden Eagles hit five home runs in the opener, Brown finishing with two home runs in his 2-for-5, three RBI effort. Flick also went 4-for-5 and that duo was part of six different TTU hitters with multi-hit outings. Tennessee Tech opened the scoring in the nightcap when Strohschein hit a two-out solo home run for an early advantage. Golden Eagles starter Jake Usher made the lone run hold up through three innings, striking out the first four Govs batters he faced and allowing only a walk in the third. TTU extended its lead in the fourth when Brown hit his third home run of the day, a two-run shot that pushed the lead to 3-0. Shortstop David Garza tripled later in the frame to drive in another run for a 4-0 lead. Austin Peay charged back in its half of the fourth, using four doubles to grab the lead. Left fielder Cayce Bredlau began the run with his one-out double. After Phillips was hit by a pitch, first baseman Dre Gleason, designated hitter Robles and right fielder Chase Hamilton each had RBI double. Hamilton would later score on a wild pitch to give the Govs their first lead, 5-4. Phillips would extend that advantage in the fifth with a two-run home run over the center field wall for a 7-4 lead. But Tennessee Tech regained the lead in the seventh with a string of five straight base hits. A one-out walk followed by singles from Chambers and Brown loaded the bases and ended the day for reliever Brett Newberg. Reliever Landon Kelly was greeted rudely as Harris hit a two-run single and second baseman Matt jones added a two-run double to grab the lead, 9-7. Austin Peay would get within a run in its half of the seventh when infielder Max Remy hit a one-out double and scored on Phillips’ single. But Tennessee Tech got that run back in the ninth when Jones drove in Chambers. Kelly was the hard luck loser after allowing two runs on three hits in his two-thirds of an inning. Govs starter Michael Costanzo did not factor into the decision after allowing four runs on six hits through four innings. Phillips ended the nightcap with a 2-for-3, three RBI outing. Hamilton also had two hits and a RBI. TTU reliever Nick Osborne (2-0) picked up the win after tossing a scoreless sixth inning. Closer Ethan Roberts picked up his sixth save after he went the final three innings, limiting APSU to one run. Jones went 3-for-5 with three RBI to pace the Golden Eagles’ offense while Brown, Harris and Garza each had two RBI. Infielder/catcher Parker Phillips had a home run in each game of the doubleheader and finished the day 4-for-6 with four RBI. In the opener he had two hits, including a solo home run to center field in the third inning. The nightcap saw Phillips post another two hits, including a two-run home run in the fifth. He would tack on a RBI single in the seventh for his fourth RBI. Phillips became the second Govs hitter to record home runs in back-to-back games this season, joining senior first baseman Dre Gleason (Middle Tennessee and Mercer). They home runs also were Phillips second and third home runs in his last four games. Freshman outfielder Tyler Hubbard hit a pinch hit home run in the series opener, becoming the 13th different Govs hitter to post a home run this season – setting a program record for most hitters with a home run in a season. Austin Peay saved all of its five doubles for the nightcap. The Govs strung three doubles together in the fourth – an inning started with a junior left fielder Cayce Bredlau‘s one-out double – to drive in four runs to claim its first lead of the day. Infielder Max Remy would add a one-out double in the seventh, which ultimately led to another Govs run. After a quiet outing in the opener – 0-for-2 with a walk and being hit by a pitch – he had a two-run double in the Govs five-run fourth as part of a 1-for-3 outing. He was able to extend his reached safely streak to 22 games. Austin Peay and Tennessee Tech are scheduled to conclude their three-game OVC series with a 1:00pm, Saturday contest, weather permitting. Schedule updates will be available at LetsGoPeay.com and on the official Govs baseball Twitter account (@AustinPeayBSB).